Computing is about understanding computers and computer systems. Every day we are using computer systems; modern civilisation would not function without it. Computer systems control airplanes, our health service, cars, coffee makers, washing machines, tax systems, the internet, microwave cookers, mobile phone networks, laptops, desktops, alarms, central heating, remote control television, traffic light systems and more. To comprehend our place in the digital world, we must understand that it is the human that is clever – not the machine. Students have one lesson of computing a week. Students experience a number of areas including: Materials, Control, CAD/CAM,Textiles, Food, Graphics and Product Design. Key skills and techniques are taught within these areas and research, designing, planning, making and students’ evaluations underpin this. Students are encouraged to pursue creative outcomes, solve problems and to think about design in the wider context. The Design and Technology department is staffed by a team of 4 specialist teaching staff, 2 specialist technicians and a DT trained teaching assistant. At Key Stage 4 we offer two GCSE options (Product Design and Graphics) as well as the BTEC Diploma in Catering. The department has strong links with Cambridge University and has successfully participated in a number of research projects. Drama in the lower school is a practical subject and students are provided with a supportive atmosphere in which to explore, develop and share their ideas. The major part of the work revolves around group role play, using the medium of Drama and the elements of Drama. We teach a range of explorative strategies, such as, thought-tracking, cross-cutting, narration, split stage, and still-image through a diverse range of topics, scenarios and stimuli. 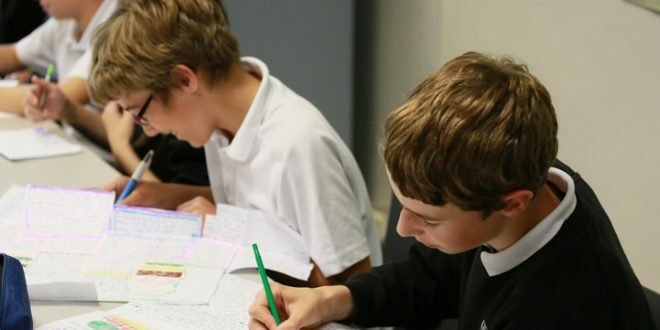 Latin in Year 8 is taught as an optional subject at lunchtime, following on from classes in Year 7. Students are given the opportunity to study the Latin language and to explore aspects of Roman history and culture, focusing on the town of Pompeii. Students are positively encouraged to make links to English and to other languages. Students continue to follow the Cambridge Latin Course and we aim to finish Book 1 during this year. It is hoped to complete an externally set and moderated test at the end of Year 8 for which a certificate will be awarded. There is a strong emphasis on mental and written calculations but the students also begin to use calculators efficiently and effectively. There are a number of themed modules to allow the application of mathematics in different contexts and there are a few extended pieces of work to build independent study skills. Students are placed in classes according to their achievements in year 7. They are regularly re-assessed throughout the year, through short tests at the end of each module of work and through longer tests towards the end of each term. They will record their performances on comprehensive analysis sheets which are used to inform any necessary intervention work. In Year 8, students rotate between 6 week blocks of PRE, History and Geography and in Year 9 it is taught as a separate lesson once a week. In Year 8, pupils are placed into sets at the beginning of the year based on their assessed work from Year 7. Attainment of pupils is closely monitored and changes to pupils group are made after key assessment points in the year in accordance with pupils’ progress and attainment. Pupils study different topics in Year 8 building their inquiry and practical skills alongside their scientific knowledge. These topics include: Life Processes and Healthy Living; The Periodic Table of Elements and Metal Reactions; Light and Sound.